The Tennessee Valley Authority's (TVA) board of directors voted on Thursday to retire its Bull Run coal plant and the Unit 3 of the Paradise coal plant despite a plea from President Trump to keep the generation open. TVA customers will save more than $1 billion from retiring the plants, according to TVA Chief Financial Officer John Thomas III, who said they "weren't designed to operate effectively for how they are dispatched within the fleet." Environmental advocates cheered TVA for the decision after President Donald Trump and Senate Majority Leader Mitch McConnell, Ky., tweeted on Monday to encourage the utility to keep the Paradise unit open. The TVA board's decision is a rebuke to the White House, which continues to search for avenues to support struggling coal and nuclear plants more than a year after its original bailout plan for generators was rejected by the Federal Energy Regulatory Commission. On Thursday, the board defeated a motion to delay a decision on the plants in a 5-2 vote, with two of Trump's four TVA appointees, Kenny Allen and A.B. Franzier, voting in support of the delay. The board then voted 6-1 to shut the final coal-burning unit at Paradise, and 7-0 to shutter Bull Run. "From an economic perspective it's clear that this is the best choice, retiring these two assets," TVA president Bill Johnson said during his presentation at the board meeting. "The situation that has evolved over time put these plants in a position where they cannot meet their design, their purpose," he added, "and nothing between now and May, and in my opinion, nothing ever will change that set of facts." Allen, who has served as the chief operating officer of two coal mining companies, was the only board member to vote against retiring the 1,150-MW Unit 3 of the Kentucky-based Paradise plant, which entered operation in 1970. The board had full consensus for retiring the 881-MW Bull Run Fossil Plant, which is based in Tennessee and came online in the mid-1960s. TVA has been refining its economic analysis of the fleet in the last six months, determining the Bull Run and Paradise Unit 3 were uneconomic, Thomas said. "Currently, these plants really weren't designed to operate effectively for how they are dispatched within the fleet," he said. Even if power demand increases and prices for natural gas — a key competitor for coal plants — more than double, TVA found the plants would not be competitive, Thomas said. 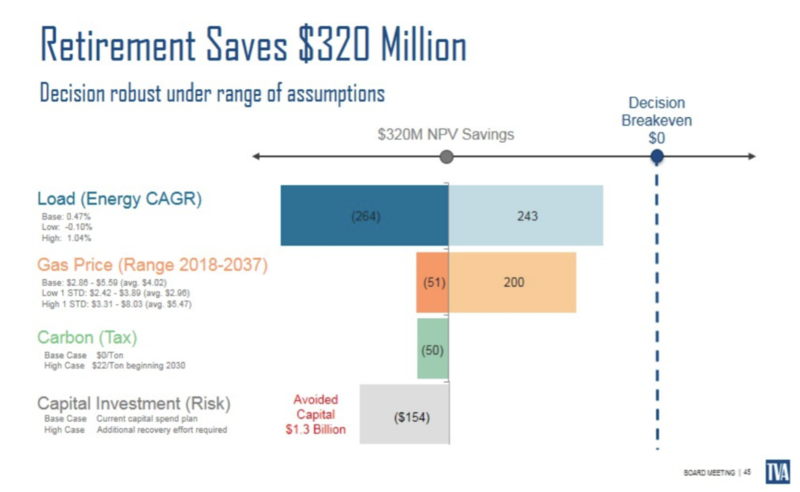 His analysis, which included the potential addition of a future carbon tax, estimated $320 million in net present savings from retiring the coal units, amounting to $1.3 billion in avoided capital costs. Environmental advocates praised the TVA decision Thursday. "This closure is an economic and environmental win-win; it is a good move for bill payers and for the environment," Stephen Smith, executive director of the Southern Alliance for Clean Energy, said in a statement. "There is an opportunity to continue the progress started today, and bolster communities that have relied on coal, by investing in a clean energy future and moving forward with additional coal retirements." The Southern Environmental Law Center (SELC) also welcomed the retirement decision, but said TVA adopted changes to its renewables programs that limit customer choice. "TVA continues its pattern of double-talk with these changes to its renewables programs, telling the public that 'TVA must adapt,' while at the same time shutting down options for customer choice, especially for the little guy," Amanda Garcia, senior attorney for SELC, said in a statement. "The devil is in the details, of which few were presented, but none of these changes appear to foster real energy choice in our local communities."